Use: Sewing, Embroidery. 1 x Lot Cotton Thread. Material: Polyester / Cotton. Quantity: 1 lot = 50 pcs = 50 random colors. Strands: 6. 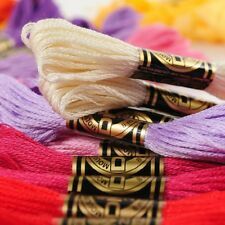 Stranded Cotton is the most versatile embroidery thread and can be used for freestyle and counted thread embroidery and is particularly popular for Cross Stitch. New Anchor Embroidery Floss, 100% cotton and Colorful threads. IF YOUR ORDER IS OVER 24 SKEINS FOR ONE COLOR NUMBER. Each skein is NEW 8m (8.7 yards) of six stranded. 107 355 606 793 921 3047 3781 3859 17. Made with 100% long staple cotton. 115 367 610 796 924 3052 3787 3861 19. Echevette de 8 mètres Coloris blanc lumineux = B5200 Coloris blanc = Blanc Coloris noir = 310. U ontvangt 220 nieuwe strengen dmc. Each skein is NEW 8m (8.7 yards) of six stranded. IF YOUR ORDER IS OVER 24 SKEINS FOR ONE COLOR NUMBER. IF YOUR ORDER IS OVER 24 SKEINS FOR ONE COLOR NUMBER. Each skein is NEW 8m (8.7 yards) of six stranded. Made with 100% long staple cotton. __322 __500 __648 __779 __869 __951 __3053 __3756 __3827. I will try my best to help you. Each Skein is about 8m/8.75 yard in length & 6 strands. New Anchor Embroidery Floss, 100% cotton and Colorful threads. Quantity: 100pcs. 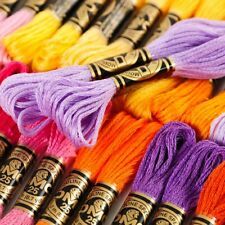 Stranded Cotton is the most versatile embroidery thread and can be used for freestyle and counted thread embroidery and is particularly popular for Cross Stitch. 100 x Embroider Line. Great for children, friends, moms, colleagues or cross stitch lovers. - Great for children, friends, moms, colleagues or cross stitch beginners or lovers. Sincerely hope that you can understand! 100 x Embroider Line. Great for children, friends, moms, colleagues or cross stitch lovers. - Great for children, friends, moms, colleagues or cross stitch beginners or lovers. Your support for us always. HUGE Lot 350 NEW Skeins DMC Cotton Embroidery++ Floss MANY COLORS!! Huge lot of embroidery DMC. Count of 350 is based on weight 25oz. Echevette de 8 mètres Coloris blanc lumineux = B5200 Coloris blanc = Blanc Coloris noir = 310. Each skein is NEW 8m (8.7 yards) of six stranded. IF YOUR ORDER IS OVER 24 SKEINS FOR ONE COLOR NUMBER. I suppose that these bigger skeins were a part of a kit. Each bigger skein has a different color. The DMC skeins seems like new, as the other ones actually. The whole lot is still in a great shape. Number 712 there is 2 in the lot. Number 632 there is 1 in the lot. Number 744 there is 1 in the lot. Number 833 there is 1 in the lot. Number 783 there is 1 in the lot. Tinksky 100 Skeins of 8M Multi-color Soft Cotton Cross Stitch Embroidery Threads Floss Sewing Threads (Random Color). Manufacturer: Tinksky. 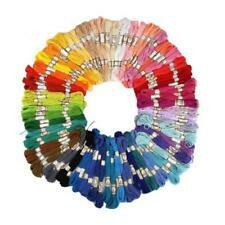 100 skeins of the cross stitch embroidery thread in one set will be sold together by random color. Tinksky 100 Skeins of 8M Multi color Soft Cotton Cross Stitch Embroidery Threads Floss Sewing Threads Random Color. 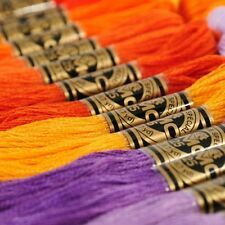 100 Skeins of 8M Multi-color Soft Cotton Cross Stitch Embroidery Threads Floss Sewing Threads (Random Color). Tinksky 100 Skeins of 8M Multi-color Soft Cotton Cross Stitch Embroidery Threads Floss Sewing Threads (Random Color). 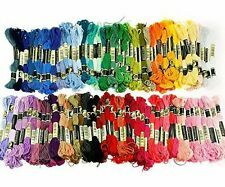 100 Skeins of 8M Multi-color Soft Cotton Cross Stitch Embroidery Threads Floss Sewing Threads (Random Color).